Bloomsbury Children's Books, 9781408815823, 128pp. It is the year 5012 and the Milky Way galaxy is under attack. After the Universal War, a war that almost brought about the destruction of every known universe, the planets in the Milky Way banded together to create the Intergalactic Force - an elite fighting team sworn to protect and defend the galaxy. Only the brightest and most promising students are accepted into the Intergalactic Force Academy, and only the very best cadets reach the highest of their ranks and become . 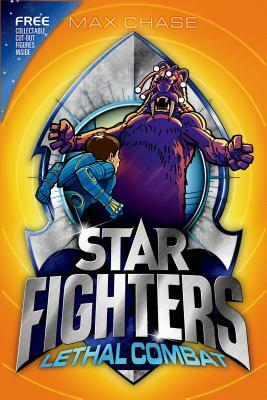 . . STAR FIGHTERS! Lethal CombatThe crew of the Phoenix have escaped the dark planet, and now need to complete their mission to return Prince Onix to his home planet - without them knowing. But their plan is foiled and the Xions capture them soon after landing. They are asked to choose their punishment: 1) Be ejected into space in a pod that orbits Xion forever 2) 20 years hard labour in one of their mines 3) Fight the deadly Xio-bot. They choose to fight the Xio-bot. It's their only chance to make it back home again - but no one has beaten it . . . yet. Max Chase is the youngest of three brothers. He was born in England but grew up in Hong Kong. He has a black belt in karate and a red belt in Wing Chun. He has been writing since he was eight years old and now earns a living as a freelance journalist. He always dreamed about being an astronaut or a cowboy. With Star Fighters, he gets to be a little of both.